The China National Petroleum Corporation (CNPC), the world’s third-largest oil company, has been awarded stakes in two of Abu Dhabi’s offshore concession areas following the signing of agreements with the Abu Dhabi National Oil Company (Adnoc) today. Under the terms of the agreements, CNPC, through its majority-owned listed subsidiary PetroChina, has been granted a 10 per cent interest in the Umm Shaif and Nasr concession and a 10 per cent interest in the Lower Zakum concession. PetroChina contributed a participation fee of Dh2.1 billion ($575 million) to enter the Umm Shaif and Nasr concession and a fee of Dh2.2 billion ($600 million) to enter the Lower Zakum concession. Both concessions will be operated by Adnoc Offshore, on behalf of all concession partners. The agreements were signed, in Abu Dhabi, by Dr Sultan Ahmed Al Jaber, Adnoc Group CEO and Wang Yilin, CNPC Chairman. The agreements have a term of 40 years and are backdated to March 9, 2018. 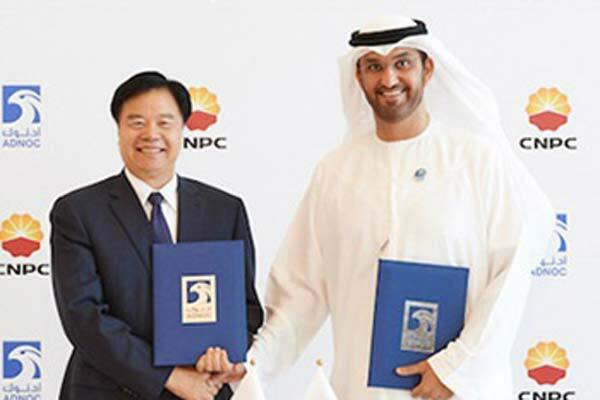 Dr Al Jaber said the expanded collaboration with CNPC further strengthens and deepens the strategic and economic relationship between the UAE and China, the world’s second largest economy. “Energy cooperation is an increasingly important aspect of the UAE’s relations with China, the number one oil importer globally and a major growth market for our products and petrochemicals. These agreements are new milestones in Adnoc’s thriving partnership with CNPC and also represent an important platform upon which we can explore opportunities further downstream. China's largest oil and gas producer and supplier, CNPC, through PetroChina, produces 52 per cent of China’s crude oil and 71 per cent of its natural gas production, and has exploration and production activities in more than 30 countries in Africa, Central Asia-Russia, America, the Middle East and the Asia-Pacific. In 2016, PetroChina produced 772.9 million barrels of crude oil and 3,464 billion cu ft of natural gas in China. In February 2017, CNPC was awarded an 8 per cent interest in Abu Dhabi’s onshore concession, operated by Adnoc Onshore. It also has a 40 per cent stake in the Al Yasat concession with Adnoc. The Umm Shaif and Nasr concession, and the Lower Zakum concession have been created from the former Adma offshore concession, with the aim of maximising commercial value, broadening the partner base, expanding technical expertise, and enabling greater market access. The Umm Shaif field’s Arab reservoir is characterised by a huge gas cap – one of the largest in the region – with reserves rich in condensates. The gas cap overlays an oil rim which, in combination with Nasr field, has a crude production capacity of 460,000 bpd. Adnoc plans to process 500 million standard cubic feet of gas per day from Umm Shaif’s gas cap to help meet Abu Dhabi’s growing domestic demand for energy. The condensates, from the gas cap, will be refined to extract higher value products that can be used in a variety of petrochemical applications.